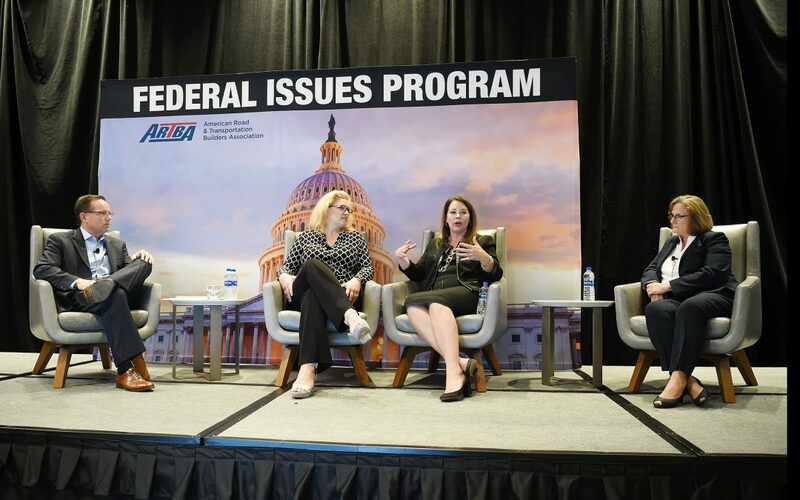 2018 ARTBA Chairman Matt Cummings moderated the Women Executives in Transportation Construction Panel featuring, left to right, Rebecca Wood, Lisa Robert and Jeanne Cormier. Rebecca Wood, founder of Superior Traffic Control and 2018 president of Tennessee Road Builders Association. ARTBA 2018 Chairman Matt Cummings moderated the discussion. Cummings pointed out that about 60 percent of college graduates are women, but only 22 percent obtain engineering degrees, and that only about 13 percent of people working in the construction industry are women. The ranks of women in construction industry C-suites have grown, but they still don’t reflect the population. Robert emphasized that corporate leaders need to look at diversity as a whole, not just women, to meet the industry’s current and future challenges. Wood said it is important to ask candidates about their goals, which if met can help with retention. She also said corporate leaders and hiring managers should emphasize the construction industry offers the opportunity to earn six figures without college degrees. Robert said RS&H has placed new emphasis on considering regional variances in compensation levels to remain nationally competitive. The firm also is taking a closer look at personal and holiday leave. “We are finding we have to adjust our HR and management priorities,” she said. There was plenty of discussion about millennials, the generation that has entered adulthood and the workforce since the turn of the 21st century. Cormier and Roberts each said they are optimistic about the transportation construction market, at least over the next year. Roberts said that has raised some concerns about near-term over hiring. Wood said Tennessee is having challenges in finding enough unskilled laborers. Learn more about ARTBA’s Women Leaders in Transportation Design & Construction Council.